Paper and Twine Crafty Design, LLC: Zipper flowers! I love EASY tutorials and here's another one! Zipper flowers! I love EASY tutorials and here's another one! 1. One zipper makes two flowers. To begin, cut the zipper stop and plastic reinforcement off the ends of the zipper. Open the zipper to divide it in half. 2. Place a dab of hot glue onto one end of the zipper, on the fabric part, and close to the teeth. Fold in cut edge; press down to secure. 3. Roll end of zipper into a very tight "bud," securing with another dab of hot glue, and spiraling downward so teeth do not overlap each other. 4. Roll three more times, tacking down each roll with a dot of hot glue. 5. Continue rolling, making looser coils. Once the bud is about the size of a nickel, make a petal by forming a loop perpendicular to the bud; secure with hot glue. 6. 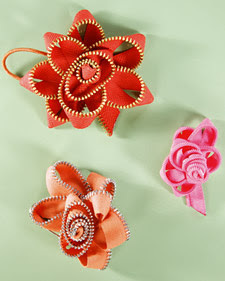 Make your next petal by swirling the zipper to create a figure eight; secure with hot glue. 7. Repeat until you reach the end of the zipper. Sew a heart-shaped piece of felt to a brooch pin or hair clip. Hot glue to back of flower.